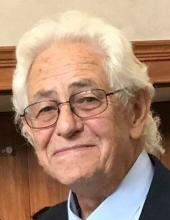 Smithville-- Gerald Richard Caskey of Smithville, Ohio died peacefully on Sunday, October 21, 2018 in Cleveland surrounded by his loving family. He was 81 year old and celebrated his birthday on October 20th. Funeral services will be held Thursday, October 25, 2018, 1:00 PM at the Gresser Funeral Home, 415 N. Elm St. Orrville. Rev. Ray Aspinall will be officiating. Burial will be at the Smithville Cemetery in Smithville, OH. Visitation will be held on Wednesday, October 24, 2018, 6-8 pm and one hour prior to services at the funeral home. The family suggests that friends may make a donation to American Cancer Society, Wayne County Unit, c/o Wooster Clinic, 721 E. Milltown Road, Wooster, OH 44691 in his memory. Gerald was born in 1937 to Mary Gail and Vernon Henry Caskey in Massillon, Ohio. He graduated from Smithville High School in 1957. While still in high school, Gerald started his own milk hauling business which he proudly ran for 47 years. In addition to his own business he also worked at Rubbermaid and drove a school bus. He attended Smithville Brethren Church, was a member of the Retired Milk Haulers Association and Wooster Rebounders Club at the College of Wooster. Gerald is survived by his wife of 60 years, Beverly S. (Edwards) Caskey, and his brother Gene Caskey of Goshen, IN. He has three children; Ken (Joann) OF Atlanta, Fritz (Margaret) of Chicago, and Karen (Dan) Harris of Indianapolis. Gerald has seven grandchildren and six great grandchildren. He is preceded in death by his parents and a brother Bill Caskey. He was an avid fan of Wooster Scots basketball and will be fondly remembered for his great sense of humor, love of boating and fishing on Lake Erie and the pleasure he took from spending time with his family. To send flowers or a remembrance gift to the family of Gerald R. Caskey, please visit our Tribute Store. "Email Address" would like to share the life celebration of Gerald R. Caskey. Click on the "link" to go to share a favorite memory or leave a condolence message for the family.